LOS ANGELES CA – “Improbable Collapse: The Demolition of Our Republic,” the first film to look at the events of September 11, 2001 from a strictly scientific perspective, will be screening at the Silver Lake Film Festival, The Los Feliz 3 Theatre, Theater #2, 1822 North Vermont Avenue, Los Angeles, CA 90027 on Saturday, May 5, 2007 at 2:15PM. 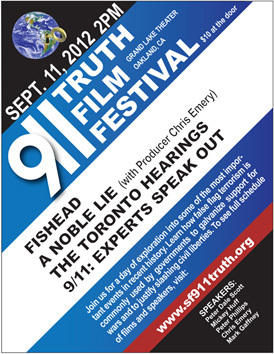 The screening will be introduced by actor Dean Haglund of the X-Files and The Lone Gunmen, followed by Q & A with film director and 911truth.org media coordinator, Michael Berger. On September 11, 2001 the World Trade Center Twin Towers disintegrated in a manner that scientists say resembled deliberately calculated implosions. The facts open for discussion include: at 5:20 p.m. that same day another building, the 47 story WTC 7, completely collapsed within 70 feet of its footprint in 6.6 seconds. These three buildings became the first such structures to ever suffer complete collapse due to fire and damage. The documentary, “Improbable Collapse – The Demolition of our Republic,” closely examines one of the world’s worst catastrophes from a civil engineering perspective. Using photo and video footage as well as expert scientific testimony, the film thoroughly examines the official reports, offering varied criticisms of the official findings, while raising a more plausible hypothesis. The findings from these scientific experts have been quietly ignored by both government investigations and the mainstream media.